There is something about Arrecife that struck me, something that left me intrigued and hit: maybe because of the low season I found an almost empty city… Very few tourists, but even the locals I thought were not in town! The general idea that I made of it is an empty city; perhaps because of the period, I chose for my trip. Personal thoughts aside, today I want to tell you what to do and see in Arrecife: because anyway, despite the idea that I made it, the city offers some ideas to visit visitors who come up here. 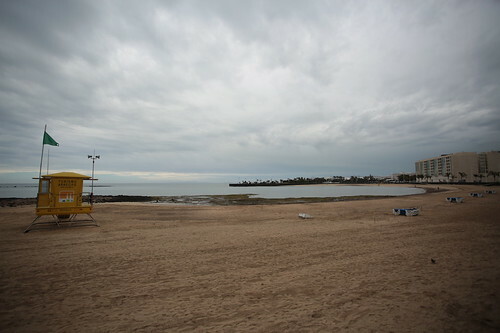 Start with the Playa del Reducto. I do not want to advise you to go to the beach to sunbathe and relax (or not only): the tide is always shallow and the part of sand is extensive and creates an atmosphere that reminded me of the Californian beaches. Several times I have seen several large and very well made sand sculptures. This beach is undoubtedly suggestive and perfect for a nice sunset walk. 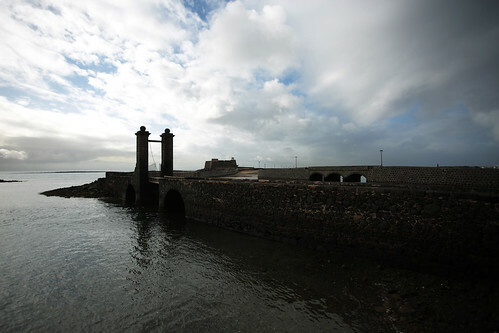 In Avenida la Marina is the Castillo de San Gabriel, where the Arrecife History Museum is located. The admission ticket costs 3 euros, and the museum is not very large. I must admit that I found a very simple gallery in the outfits, almost weak, but I was intrigued by the fact that there is a (small) mummy exposed in one of the rooms near the exit. 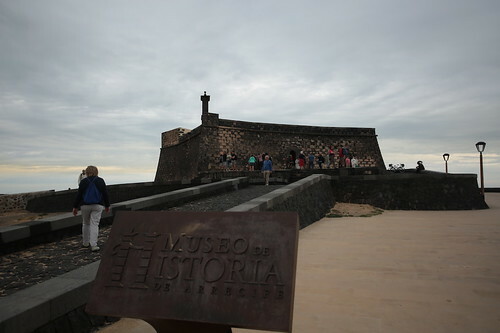 You can also get on the terrace at the top of the castle building, which offers a view of a part of Arrecife overlooking the sea. Next to the small castle is the Ponte de las bolas, with very particular lines and immediately recognisable even from a distance. The bridge is one of two streets that connect the mainland to the small island where the castle is located, and it is this bridge that I recommend you travel to get there (or at least to return to the mainland). 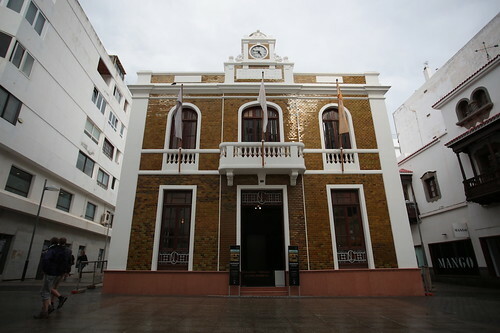 the Casa Amarilla: it is the old town hall of Lanzarote and today is an exhibition space where are set up exhibitions which tells the story of Arrecife and Lanzarote, usually through historical photographs. The building is structured on two floors and is an example of the architecture of Lanzarote dating back to the early twenties of the last century. The building was declared of cultural interest in 2002 and, despite the renovation, has maintained the original facade. The exhibitions are set up on the ground floor (the first floor houses the institutional buildings). Also, there is an information and ticket sales office for cultural events taking place in the city throughout the year. A very particular place, in my opinion, is El Charco de San Gines, a small natural seawater lagoon used as a marina. The area around is wholly pedestrianized pedestrian area, and here you can find several places to eat. 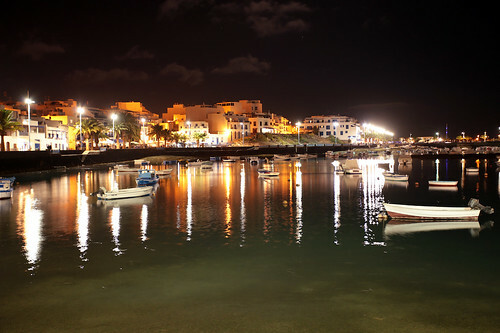 Every Saturday, on the promenade near this lagoon, there is a crowded market where you can buy “Canare” specialities (food typical of Canary Island). I suggest you to come and photograph it in the evening when all the lights are on, and the boats are still and anchored for the night: the atmosphere is, in my opinion, very suggestive! With my mum we had decided to visit the Museo Internacional de Arte Contemporáneo, at the Castillo de San José: having left it for the last day and being far enough from the centre of Arrecife, however, when we were surprised by a heavy rain we had to give up our idea. To conclude the post, I leave you some practical information about the city. 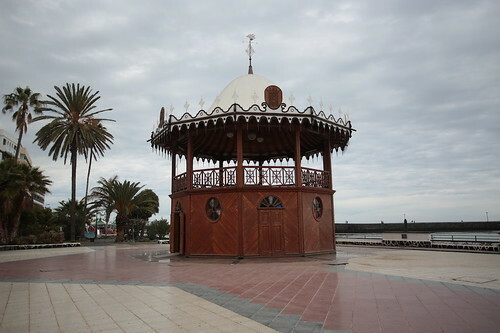 In town there are two official tourist information offices: one at the port (open only when cruise ships arrive) and the other is located in Avenida la Marina, inside the Parque José Ramírez Cerdá, and is easily recognisable for its Arab style structure. 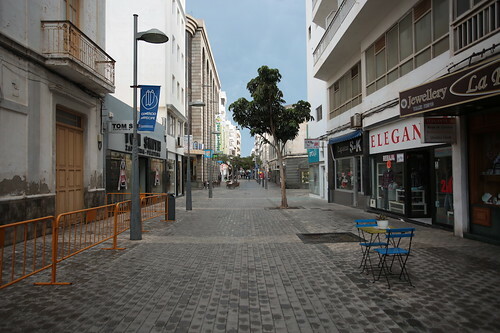 Calle Leon Y Castillo is the main artery of the shopping area in Arrecife. Here you will find local shops and also the shops of the most famous, like Benetton, Zara and H & M.
Shops and supermarkets close on Saturday afternoons and for all the day on Sundays: if you want to go shopping and to buy souvenirs remember to do it by Saturday morning. Let’s move on to two tips on where to eat. Tabla Arrecife, in Calle Dr Ruperto González Negrín 6, is a lovely restaurant/hamburger with affordable prices. You recognise it, as well as the name because it is right in front of the Real Club Nautico. The second tip is the La Miñoca Cafe Del Charco restaurant (Avda Cesar Manrique nº22, Charco San Ginés). Small and always crowded, you may have to wait for some time before you can sit down: crowded mainly by locals, offers good dishes well presented and at pretty reasonable prices. * bonus advice * If you are looking for a quick lunch, I recommend the Dolomiti Café: for 11 euros we ordered two toasts (plentiful), to drink and also ice cream (medium cup). It is located at Calle Blas Cabrera Felipe 4, not far from the tourist office.